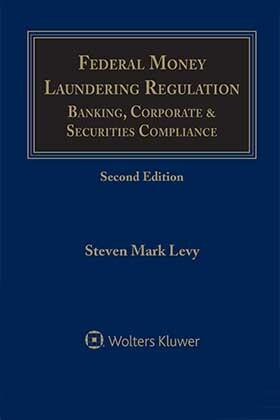 Federal Money Laundering Regulation: Banking, Corporate & Securities Compliance, by Steven Mark Levy, is your complete guide to understanding and complying with all U.S. statutes, regulations, and case law on money laundering. This valuable reference provides in-depth guidance on compliance programs, due diligence, Bank Secrecy Act reporting and recordkeeping, money laundering crimes, civil and criminal asset forfeiture, terrorist financing, OFAC compliance, and state and international measures against money laundering. Twice-yearly supplements enhance the value and utility of this treatise—now in its 18th year— in this rapidly evolving field. Money laundering laws are complex, and consequences for noncompliance harsh, including large civil and criminal fines, asset forfeitures, prison sentences of up to 20 years, and infliction of reputational harm. Federal Money Laundering Regulation is the one core holding in this area that will guide you through most regulatory questions you are likely to encounter, in readable, plain English. A related volume by the same author, Wolters Kluwer’s Regulation of Securities: SEC Answer Book, Fifth Edition, offers guidance on the day-to-day requirements of the federal securities laws that affect all public companies. 1.07 Why Combat Money Laundering? 19.02 Why Understand Money Laundering Crimes?